Beer on tap has come to the gas station. 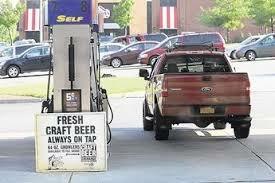 Customers can now fill their tank and a growler of beer at the same time. “It is absolutely wonderful. I’m glad they finally thought of it,” said Dawn Durham, a customer at the Four Sons convenience store at Alma School and Baseline in Mesa. Instead of bartenders, convenience store workers fill growlers full of keg beer that customers can take home straight from the tap. Beer on tap at the gas station is the result of a law change that took effect about a year and a half ago. The law allows stores licensed to sell beer and wine to also sell tap beer – sealed before you leave the store of course. “I just walked in to get a couple drinks…I didn’t expect to see this here,” said Casey Hoops, who came into the Four Sons to buy canned beer but quickly switched when he saw beer on tap. Customers and stores have been a little slow to catch on to the new law.